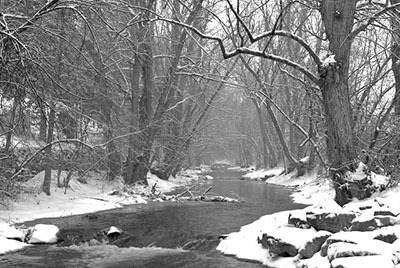 "This is a shot of Boulder Creek in Boulder, Colorado during a recent snowstorm," said Mark Castleman. "There was hardly any color in the scene to begin with, so converting it to black & white actually brought out the image better. I bracketed the shot from 0ev to +2ev in 0.5ev increments to compensate for the snow throwing off the exposure and +1.0 seemed to look best to me." Mark used a Pentax K10D, Pentax 18-55mm lens, 1/30. f/9.5, +1.0ev, ISO 100, converted to black & white in Aperture.